Three undergraduates in the Burnett School of Biomedical Sciences and a fourth-year M.D. student were among 22 UCF students inducted Wednesday into the Order of Pegasus, the university’s most prestigious student honor. Awardees are chosen based on exemplary performance in academic achievement, research, university involvement, leadership and community service. Arthuzo is senior majoring in biomedical sciences at the Burnett School. Working with faculty researcher Dr. Alicja Copik, she has conducted research in using the body’s “natural killer” cells to fight cancer. During her time at UCF she has been part of the LEAD Scholars Academy and has participated in the Program for Undergraduate Research experience. She has done two medical mission trips to Peru and one public health trip to Nicaragua, which she says have helped develop her passion for global healthcare. After graduating in spring 2019, Arthuzo will apply to medical school to pursue her dream of becoming a neonatologist. Denierio is pursuing dual degrees in biomedical sciences and anthropology (College of Sciences), as well as a minor in biology. She is a LEAD Scholar and member of The Burnett Honors College, Honors Congress, National Society of Leadership and Success, and the American Medical Student Association. As an anthropology major, she studied bone fragments from ancient Peruvian societies to determine their migratory patterns, the spread of diseases, and the overall health of cultures during specific time periods. 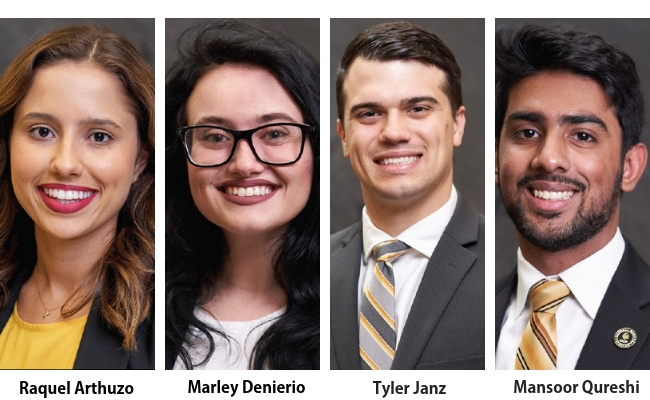 As an honors peer advisor, honors orientation ambassador and peer mentor, Denierio assisted students in acclimating to UCF and achieving academic success. After graduating from UCF this spring, Denierio plans to pursue a M.D. or Ph.D. in preparation for a medical career with a global health organization. Janz graduates with his M.D. this May and thanks UCF for the opportunity to participate in medical research early in his College of Medicine career. Janz, who suffered from chronic ear problems in his childhood, has focused his research on otolaryngology, a surgical subspecialty that deals with conditions of the ear, nose and throat. After his third year of medical school, he spent a year doing clinical research at the Medical University of South Carolina, identifying reasons for delay of post-operative radiation therapy among head and neck cancer patients. He also researched the psychosocial impacts of head and neck cancer patients receiving treatment. Janz has also spent the last eight years designing a cost-effective device to help patients with eustachian tube dysfunction. The device aims to help dilate the eustachian tube to improve functioning and is currently awaiting patent approval. After leaving UCF, Janz will begin his residency training in otolaryngology at the University of Texas Medical Branch in Galveston, Texas. His goal is to become a holistic physician who incorporates community service, innovation, and research to further advance medical care for patients. Qureshi, a senior biomedical sciences major is a member of the Burnett Honors College and the LEAD Scholars Academy. At UCF he has been extensively involved in the Honors College serving as a team leader, orientation ambassador, and as an Honors Congress philanthropy committee member. He has also helped guide other students as a COMPASS mentor, teaching assistant for the Burnett School of Biomedical Sciences, and peer mentor for the Office of Undergraduate Research. After graduating this year, he plans to attend medical school, and hopes to improve healthcare delivery and public health education while providing care to underserved communities.